Once you have arrived in Hidden Harbor you will be welcomed by tropical island foliage and winding cobblestone streets. 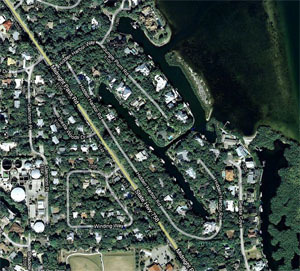 Hidden Harbor certainly is one of Siesta Keys most exclusive and beautiful neighborhoods located on the Roberts Bay side if Siesta Key just east of Midnight Pass Road. This is a neighborhood that has seen a lot of change in its history. Many of the original homes in the community have either been raised to make way for more stunning homes or completely remodeled. Regardless of the home that catches your eye here, you will be purchasing a home in one of Siesta Keys most desirable neighborhoods. Hidden Harbor homes for sale range in size from 2,300 square feet to more than 7,000 square feet. These Indulgent estate homes range in price from $1 million to nearly $7 million. Some of the finest architectural styles can be found in Hidden Harbor, from an opulent Polynesian styled home named Hale a ka la, to fine Mediterranean styles, you will certainly find this neighborhood contains an eclectic mix of homes that appeal to very affluent home buyers. Hidden harbor is an extremely well protected harbor that is absolutely perfect for a sailboat or large fishing boat. The large trees and homes surrounded the harbor offer a great wind break and there is never a day where you have any chop on the waters surface. If you are the proud owner of a Hinckley or other fine craft, you certainly will not fine a safer place to moor your boat on Siesta Key. Below are all of the current real estate listings available for sale in Hidden Harbor as of 6AM this morning.